One of the most popular cosmetic dental treatments is teeth whitening, which restores the natural brightness of your teeth for a more dazzling smile. Whether your teeth are discoloured from wine, smoking, or something else, teeth whitening is a very effective and simple way to achieve a better smile. Even those who take good care of their teeth may find that age, environment, and general wear and tear have discoloured their teeth, so this treatment can help anyone who yearns for a cleaner smile. As a low-risk procedure, teeth whitening is suitable for most patients, although won’t work as well for those who have veneers, crowns or other restorations on their front-facing teeth. Those with sensitive teeth, or those who have intrinsic stains such as grey discolourations, white spots on the teeth, or discolouration from a ‘dead’ tooth, the whitening treatment may not be as predictable. Please contact your closest Aim Dental Group and schedule an appointment with one of our dentists for advice on Whitening option that are best for you. Although take-home whitening is quite effective, in-office care usually offers the most dramatic results. At Aim Dental Group, we offer Zoom whitening to our patients, which is perhaps the most well-known teeth whitening brand. 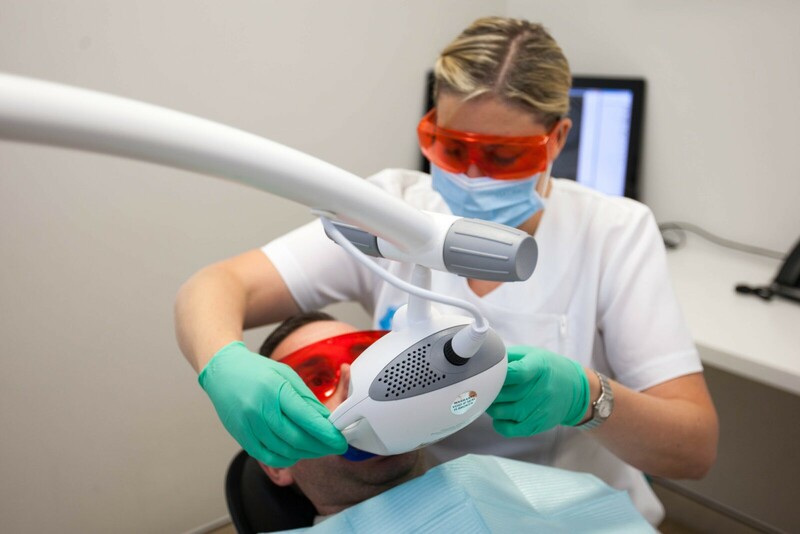 In-office treatment uses whitening gel with a 25% concentration of peroxide, while chair-side whitening utilises a proprietary blue light, which stimulates the whitening process. We also give you complimentary take-home Zoom kits to help you to maintain your new smile. If you’d like to find out more, please talk to our dentists in Woodvale, Maddington, or Merredin.